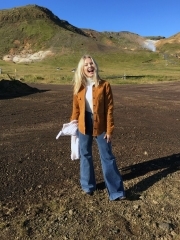 Norway has found its newest indie pop darling in Astrid S. The 19-year-old singer-songwriter got her start on Norway’s Pop Idol, but has naturally moved away from her time on the show. Within the past year, she’s released only two singles “2AM” and most recently “Hyde,” but her songs have recently made her a “Spotlight Artist” and “One To Watch 2015″ by Spotify Norway.If you notice some similarities to Halsey’s songs on “Hyde” it might be because her boyfriend and collaborator Lido helped Astrid S produce it. 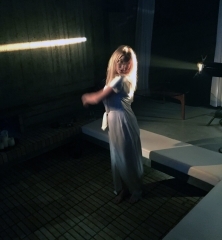 She even won an MTV EMA Award for “Best Norwegian Act.” Fans of KATE BOY and Tove Lo will love this Norway export. While Astrid S won’t be releasing any more music this year, you can expect much more to come in 2016. In her first proper U.S. interview, Astrid S talks TV stardom, working with Lido and being drunk in love, alongside an exclusive look at behind the scenes photos from her “Hyde” video shoot. Moving away from TV stardom: It hasn’t been my goal to move away from Pop Idol—it just happened naturally. When I started writing after the show, it was just natural for me to write the kinds of songs I’m releasing now. That’s the music I’m listneing to know. It was natural for me to move into this genre and become this type of artist. It’s been really cool to see in Norway that I’ve made a name for myself—not from being on Pop Idol- but from the songs I’ve released. On working with Halsey’s boyfriend/collaborator Lido: We met previously on a tour in Norway. He’s Norwegian, heard my song and I really wanted him to work on it. He wanted to jump on it, so it worked out. Then I was in LA in August and we met up, ate pizza and worked on the song. It was great. The stories behind “2AM” and “Hyde:” I think the funny thing about those songs is how you can be so affected by alcohol, drugs and how the feeling of being in love can feel like being drugged or being drunk. For my other songs coming, they’re about being young in the business where people don’t expect you to have strong opinions or actually write your own songs. It’s really awkward for me because I don’t feel like a child, but I don’t feel like an adult. New music: I’m releasing some stuff this year—just a few small, cool things for my fans. Next year I’m releasing a few singles and then an EP is coming. I want to release more music first and then collaborations will come—you’ll see who I worked with. Influences: I think what inspired me to start playing the guitar and my audition for Pop Idol was John Mayer—I actually only heard of him only 2 or 3 years ago. He was a big influence in getting me to pursue music. I get really inspired by movies and pictures. When I see a picture, I can get a melody in my head. Sometimes I go to YouTube, mute the videos and watch trailers. Sometimes it’s really cool to play my music over the trailers. I still listen to JoJo’s early pop songs, classical music, Chris Brown tracks, The Weeknd and so many different songs. It’s rare that I only like one artist. I just don’t have one artist that I’m influenced by. Dream on stage collaboration: Maybe Tove Lo—she seems really cool. She’s big, so I would probably be a little shaky.